CONVERTED TO DIGITAL FORMAT. AVAILABLE ON FOUNDATION DATABASE. THE FOLLOWING DOCUMENTATION IS ARCHIVED. 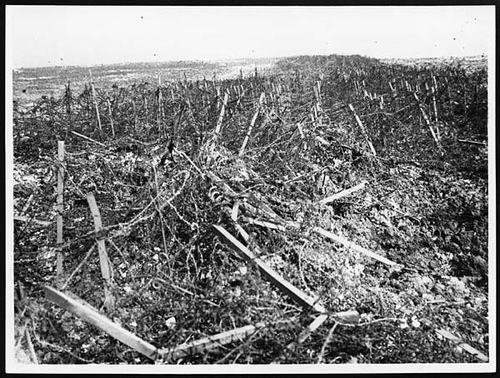 A naturally-occurring population of SCP-3328 during growth on the Passchendaele battlefront, January, 1916. SPECIAL CONTAINMENT PROCEDURES: Action must be taken to prevent SCP-3328 from propagating. All structures such as posts and fences surrounding populations of SCP-3328 are to be removed. [EDITED 02/11/1918] SCP-3328 was officially neutralised during the artillery bombardment following the third offensive of the Ypres during October, 1917. Exact time of destruction is unknown (presumably unintentional), but no further instances have been found to date. DESCRIPTION: SCP-3328 is an animate construction of barbed-wire, first reported in Passchendaele, January, 1916. Instances of SCP-3328 are known to exhibit features similar to floral life, such as the ability to reproduce and self-propagate, and are observed to reside in battlefields notorious for high casualties, presumably due to the lack of competing vegetation and abundance of edible material. SCP-3328 will naturally convolute and enmesh over all supporting structures such as posts and fences already existing within the militarised zone [No-Man's-Land]. SCP-3328 is observed to propagate rapidly, establishing frequent 'entanglements' and rendering large areas of land impassable within days. Populations of SCP-3328 are especially established in areas where barbed-wire has already been installed. Existing barbed-wire may provide structure for SCP-3328 to hang to, or provide concealment. This suggests that SCP-3328 may use its appearance as camouflage and a deterrence to prevent it from being walked over or disturbed. SCP-3328 is animate and capable of gradual movement. This is recognised to occur through slow contractions of the wire, presumably due to magnetic properties, allowing SCP-3328 to tighten and shift in position over time, however it is incapable of long-range movement or travel. Despite this, SCP-3328 will entangle and envelop individuals who pass through it. This method is similar in procedure to devices such as snare traps, and will constrict individuals to the point at which they expire from exposure or bloodloss. SCP-3328 is observed to target individuals who are already wounded or unable to resist, and at times refrains from engaging larger groups to prevent discovery. Senior Report::: ██/██/1916. Cpt. Johnson. 32nd. Reporting to confirm the loss of a British Mark V Tank near Ypres, exact location unverified and pending. Vehicle found without crew, abandoned 200 yards behind advanced trenchline. Deemed unrecoverable due to the amount of barbed-wire enmeshed around it. Cause of breakdown appears to be due to compression of the tracks following severe entanglement in the wire. Most extreme case so far recorded. Chassis degraded extensively. Recognised as abrasion from the wire. Most of the metal has degraded. Parts of engine could be recovered, but current internal state is unknown. Wire wall appears to have been drawn over the vehicle, hindering access to the hatch. Recovery would require extraneous effort regardless. Suspected A.W.O.L crew. So far not found. Keep aware. Further investigation advised. Cpt. Venkat suggested report into the loss of supplies in the region. Results conclude that the disruption is not due to shelling, and disproves any notion of such degree. Supply carts have been recovered from within the wire line still attached to their horses. Many of the animals are decomposed and have been abandoned, and the drivers are nowhere to be seen. The loss of so many animals due to the fences suggests that they are no longer an asset to us. They are too close to the tracks. I assume the animals had fallen from the embankment and entangled themselves in it. Regardless, you surely understand the risk of running wire next to horses. I propose we move the wire backwards several yards to avoid further disruption in the supplies. Sent half a fireteam to cut it back and re-stake. Are these your men? They didn't report back to me - I assume they reported to you. Regardless, the wire has moved back several yards. Tell one of the corporals they left their rifles down here. We're low on supplies as you've said. Apologies for the notification, Officer. Document 3328-3 | Transcribed Aviation Message, Ypres, Centre ████, 4:22P.M. THE REST OF THE PATROL ARE DEAD. WE WERE ON THE ROAD PARALLEL TO THE 207.4 WHILE CLEARING THE ENTANGLEMENTS. IT CAUGHT THEM BY THEIR THROATS. ASK WHITE TO EXPLAIN. DON'T SEND ANYONE ELSE THIS WAY. GOD HELP ME. YOU WON'T FIND MY BODY. - YPRES. 144th 1st BN. for conditions of acceptance, see over. Non-returnable. I understand you are an entrance to the so-called Containment Foundation, so may you pass this to whoever it needs to be given to. The wire has been causing us trouble for some time. We tried to keep it quiet but people kept going missing. Now we all know, and people who are scared cannot be controlled. I've seen the wire move myself on too many an occasion and every time denied it, but I watched it kill the cavalry brigade as they went to search for help, and I know for certain it is real. We found some of the bodies miles out in No-Man's-Land. We think it drags them out there for some reason. It took us a while to realise that supplies weren't reaching us. We pushed too far into enemy territory, and we occupy their trench right now. The wire is behind us as we speak. We are stuck here. Those who tried to find help are dead. We cannot retreat. When some of us realised supplies weren't arriving we tried to clear it. Nothing worked. Wire cutters can't get a grip on it. It just keeps getting closer to the trenchline. Every day, it's another foot nearer. We have no hope of clearing it now. Someone suggested we contact you. We cannot retreat. Do you understand? Please act immediately. I don't know how long it will take until it enters the trench with us, and we will be forced to invade the next one. Sir, the Foundation is not authorised to issue removal or destruction of an object. We may be able to offer containment services, however, although our assets are currently intervening in more pertaining matters than the one you described. We will dispatch when possible, which may be in the coming weeks. NOTE: 122nd/144th infantry companies were decommissioned after sustaining massive casualties following an unplanned and unauthorised attack on the next German trenchline. It is expected that SCP-3328 was the cause, and has since been prioritised.